Not long ago, a Hebo Stone Pagoda in Guitang Village of Guilin was stolen. For the local villagers, they lost the river god who guarded the peace in mind; and for Guilin, it meant the loss of a â€œcity treasureâ€ class cultural relics. Rich cultural history and culture left many â€œfield artifactsâ€ in the rural fields of Guilin, such as stone carvings and wood carvings. Many of them belong to cultural relics, but due to their remoteness or lack of management, they have been frequently stolen in recent years. Many of the field relics that have survived hundreds of years of wind and rain have frequently encountered black hands in recent years. Who is licking them? Where did they go after they were stolen? What are the reasons for this? The stolen Hauber stone pagoda mentioned earlier in the Guilin â€œShi Baoâ€ was originally located in the northern part of Guang Ming Shan, a branch of Jiashan Street in the western suburbs of Guilin, and is located on the bank of the Taohua River in the east of Gengtang Village. The villagers said that in the past there were frequent floods, and the villagers thought that the â€œriver demonâ€ was acting as a stranger and repaired the â€œriver demonâ€ in the town of Boyi. Villagers told reporters that in addition to this tower, the years of stone carving in the village have been almost stolen in these years, including stone horses, stone basins, and so on. Two months before the stone tower was stolen, the nine stone villains on the field also No sign. Qin Dongming, a cultural relic protection officer in the village, told reporters that the stone pagoda was gone. The villagers reported to the police and informed the cultural relics department. The whole villager chased it very far along the road but found nothing. The villagers regret that they had sealed the road leading to the stone pagoda. It is understood that according to the latest statistics from the Guilin Cultural Relics Protection Unit, Guilin has 5 state-level key cultural relics protection units, 12 autonomous region-level cultural relics protection units, and 46 municipal cultural relics protection units. The stolen Hebao Village Hebo Stone Pagoda is one of Guilin's city-level cultural relics protection units. It is regarded as the "city treasure" of Guilin. Its theft means that Guilin city-level cultural relics protection units have become 45 places. Theft of cultural relics in the field frequently In recent years, Guilin's â€œfield artifactsâ€ were stolen. On December 25, 2008, a Songshi lion was stolen in Liangjiangcheng Village of Chenglian Village, Liangjiang Town, Lingui County. The villagers offered a reward of 3,000 yuan to recover the lion. In the case of a lion burglary occurred in Liucun, Sitang Township, Lingui last September, the villagers had done a very fine job of anti-theft, but they still did not guard against stealing the lion. However, after 49 days, the stone lion that was protected by the villagers as a â€œtreasureâ€ was still stolen. There is an old saying that if you have a thief for a thousand days, how can you prevent thieves for a long time? The Linggang Ling Village in Lingchuan is a national key cultural relics protection unit, and its anti-theft has also encountered difficulties. According to the deputy branch of the village committee, Mo Zhizhong, the objects of protection in the village are ancient dwelling buildings and ancient tombs inside and outside the village. In the past, the thieves mostly focused on carved doors, wooden windows, and foundation stones of ancient dwelling houses. Two; In 2007, Murakami established a cultural relic protection team to patrol at night, and the number of stolen parts of ancient folk houses was reduced. However, the protection of ancient tomb stone carvings outside the village left a headache for the villagers. Mo Zhizhong said that there are more than 130 ancient tombs in the village, scattered in the wild, the furthest distance from the village is nearly 20 kilometers, and the protection team can not control four people. At present, there are known stone carvings of three ancient tombs stolen. Jiang Guiying, Director of the Lingui County Cultural Relics Management Office, told reporters that there were indeed many stolen stone carvings in the fields in the past two years. In 2011, after the local police had filed the case, the Bureau of Knowledge Management requested that the number of cases involving stolen lions be linked to the price of the lions. There was no report or If the lion lion has not been registered yet, it will be heard in three days and two. The reporter learned from the Miaoling police station in Lingui County that in 2011, the institute had cracked 13 rural lions thefts. One of the seven gangs stole more than 10 stone lions within six months. One suspect in the gang confessed that he had been involved in the theft of a stone in the field 24 times. **Chen Tao told reporters that handling such cases also has a problem. Many times, although suspects have been caught, stolen goods have been lost and it is difficult to recover. Without physical objects, it is impossible to value sentencing. Afterwards, the judicial process is not easy. Where does Tianwen Logistics go? A township police station cracked 13 cases of field stone thefts in a year. A seven-person theft gang successively stole more than ten lions. There are few lions that can be recovered. So where did these stolen lions go? Behind it, what kind of market is it? The reporter found some clues from the records of the suspects in the stolen "lion" gang. The suspect Zhou confessed that, at the earliest, he watched TV's collection program and listened to TV saying that â€œLand of Landâ€ was worth the money. He began his heart, and he and a couple of people went to Linxiang Village in Sigui Township, Lingui and stole a small stone statue. In the flower and bird market with an antique boss 700 yuan deal. Several times later, he stole stone carvings. He also took to the flower and bird market and dealt directly with the receiving owner. The price of each transaction was between hundreds and ten thousand yuan. The characteristics of their transactions are that the two parties only talk about the price, and the word does not mention the source of "goods." It can be seen that Guilinâ€™s stolen field relics are the first part of the local antique market. From February 12 to February 18, reporters observed the local antique market. In another antique shop, in response to a reporter asking whether there is a stone carving in the Ming Dynasty, the owner said: â€œNo, there are a few in the small ones.â€ In a corner in front of the shop, the boss introduced three weathered stone carvings to reporters. , "The small 200 yuan, the headless Buddha 600 yuan, the large land 1000 yuan." Asked about the source of the three stone carvings, the boss also said nothing. In an antique shop, the owner offered a price of 35,000 yuan for a pair of stone lions, which he called "in the late Qing Dynasty." Listening to reporters who wanted to buy the Ming Dynasty, the boss said, â€œFollow me,â€ and then took a flashlight and shone down under a square table. At the bottom of the table, four stone censer sheltered a small stone lion. â€œThis, Ming Dynasty.â€ The boss said, holding a flashlight and continuing to walk in. In the cubicle under the stairs, the flashlight held on to the two older lions lying one by one. One of the heads was damaged. The boss told reporters that these years are far longer and cannot be sold outside. He said that people in the country often contacted him and found photos of suitable lions. If the right price was given, that person would get it. "This kind of goods is not much, very much sought after, every antique shop wants, want to have a good relationship with those people, but also bid for the right to buy." The boss said that those who buy these lions are mostly selling hands. For money, stone carvings flow from here. Many will flow to the larger antique market in Yongzhou, Hunan, where they will sell at a high price. Many stone players from the north will receive goods there, and some of the valuable ones will pass special ones. Channels, resold to foreign countries, have higher prices. In another shop, the woman who held the shop had a Hunan accent. She told reporters that the shop was full of broken ones. The complete, paired stone lions had long been taken away by the antique dealers in Hunan. . In the interview on the protection of cultural relics in the field, more than one antique shop owner told reporters that in fact, they are not optimistic about these field stone carvings. â€œThere are not many people who play and can't sell, but everyone is rushing to buy and they all follow suit. I miss you." Gui Zheng, vice president of the Guilin City Collectors Association, believes that the collection value of these stone carvings in the field is actually insignificant. Regardless of how it is resold, its ultimate use is mostly for courtyard town houses. Moreover, the time of the stone carvings of these thefts in Guilin was not too long. The Ming and Qing Dynasties were mostly populated with more historical values, collection values, and limited cultural heritage values. But what is strange is that the crazy theft and acquisition of these stone carvings is getting worse. "This is actually an irrational collection of mentality in the strange." Yin Wenjun, Guilin cultural relics inspection team believes that in recent years, the collection has been frittered, has gone beyond the rational state. Anything as long as it is detached from the artifacts and touched with antiques will cause people to feel hot. The stolen person, in fact, many do not know the value of the stone he stole, but to see that someone stole it, sold it for money, and managed him 3721, and stole again. The irrational collector's fever is an accelerator for the theft of fanaticism. The consequence of this is the loss of a large amount of historical and cultural heritage. 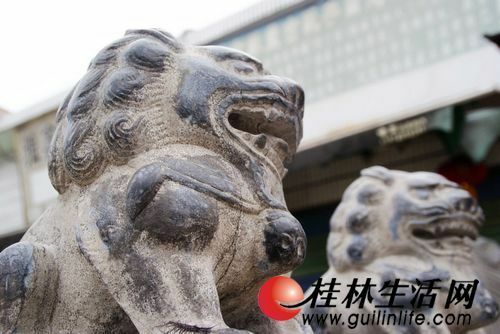 Yin Wenjun said that at ordinary times, in the inspection of the antique market, as long as it is discovered that there may be antiques of cultural relics, the cultural management department will prohibit its sale, such as stone lions, columns, carved doors and windows, once these things are lax supervision, it will lead to The cultural dealers destroy the ancient buildings. However, in the actual management process, the relevant departments also have problems. "According to the provisions of the National "Cultural Relics Management Law," as long as they can produce antiques from legal sources, they will be able to circulate in the market. However, for antique stores in the antique market, it is a regulatory difficulty. It is not that we do not care, but that The law does not have relevant provisions in this regard.â€ Yin Wenjun said that to see antiques, which may be cultural relics, be sold in the market, the owner may be required to put it away, prohibit the sale, and register for the record. However, what kind of antiques were collected in each store every day and what antiques were sold was not registered with the cultural relics department. The department of cultural relics had thought about supervising antiques entering and exiting the antique market, but the relevant laws did not provide such regulations. There is no authority to authorize the cultural relics department. Therefore, the regulation of private transactions in the market is currently a vacuum. Although many of the final destinations for such field carvings are used for the purpose of building houses in front of the building, they are changing from one place to another. However, it is very difficult to find the source of a lion under the current management system. 1. It's very usually used to make ladies' garment,dress,T-shirt and sportswear,because of its soft comfortable handfeel ,good color fastness andstretch. 2. We can and will control our fabric quality with mature technology, and also provid our service with much sincerity. 3. Free samples offered from all of our designs and available colors,pls chose on our website or write to us for sending more design pictures to you.